The old man is always there. He is always perched on a rickety old crate, his hands cradling an accordion. This is his place, at the bottom of the escalator, pushed to one side. This is where he spends his day, watching the long line of people travelling up and down. Everyone has somewhere to go, somewhere to be, somewhere to call their own. For the old man, it is this spot. Even when night falls, he stays put, perhaps hoping that someone will take note and slip him a spare coin or two. I am a stranger to these parts, staying across the road. There is a conference in town. This is what I have travelled here for. I do not speak the local language fluently but know how to order a croissant and a pot of tea. This, and some basic phrases are enough for the week. I pass the old man every day, listening to the mournful tunes that are his melody. It was his music that first told me of his presence, beginning on the day I arrived, suitcase in hand, trying to decipher the directions to my hotel. It was peak rush hour and I felt lost, almost crushed in the maelstrom of bodies surging past. The tune of the accordion was my guiding light, helping me pick my way through the chaos and emerge the other side. The old man did not notice me that day. He was too busy cradling his accordion, playing a tune from the depths of time. Perhaps it reminded him of days gone past, of when his limbs were young, of when he lived another life. Twice a day I see the old man. My eyes seek him out without knowing why. His music is deep and soulful, yet it appears that I am the only one so moved by it. The world seems to have moved on. Everyone looks so busy, eyes cast down, phones glued to their hands. No one notices the small, unshaven old man sitting by the side. It’s my last day in town today. The conference is over and I’ll be catching my train in a matter of hours. This time I don’t even have to look for the old man for his mournful melody reaches me before my eyes can seek him out. Yes, there is he, as if he has always been part of these surroundings. A permanent fixture, a landmark, a beacon in the dark. I open my wallet and see the wad of notes, in a currency that I will no longer need. I walk over to the old man, kneel down and reach out with the bundle folded in my hands. He stops playing for a moment, blinking his rheumy eyes as if to remember where he is. He looks at me, and then his ancient handkerchief. This is where the errant coins usually land. His eyes move to my outstretched hand. I open my fist a fraction so he can see that I come in peace. What happens next takes me by surprise. The old man clasps his hands around mine and pulls me in closer. He fervently begins to kiss my hand, with tears running down his face. “Merci, Madame, merci!” is all I can decipher. We stay in that moment, oblivious to the crowds. It’s as though time has stopped for us and there is nothing except love within and around us. At last the old man releases my hand. His sobs have quietened and his face, though streaked with tears, is strangely radiant. It’s as though years have been erased from his flesh. His eyes are brighter and there is a kindly smile that I have before never seen on his face. Then the accordion strikes, a joyful tune bursting from its ancient depths. I look back over my shoulder. 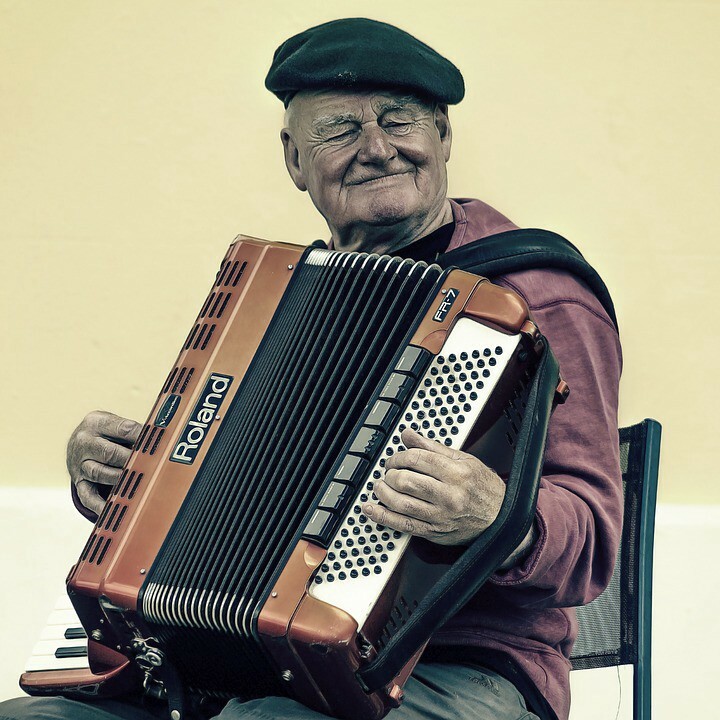 The old man is standing, playing his accordion, his shining eyes fixed on me. I feel the tears swell in my eyes and I gently bid him farewell. That tune, that note, the melody stays with me long after my trip has ended, rising to the surface in the most unexpected moments, making me smile. There are days I wonder where the old man is. I wonder if he is well, if he still plays in that same place. I have told this story only to one other. I knew this person would understand. I knew they would not berate me for handing all this money to a stranger. I knew they would not lecture me on the ethics of giving to buskers or the homeless. I knew they would not reprimand me for my actions. It was never about money. It was never about ethics. It never was about kindness. It was about being present with another human being. It was about sharing a precious, priceless moment. It was about love. Have you had such moments with strangers that have touched your heart? I would love to hear your stories. Even ISIS Couldn’t Destroy His Thirst for Knowledge.